The newly formed Economy, Infrastructure and Skills Committee of the National Assembly for Wales recently welcomed stakeholders to Cardiff to participate in an introduction event. The purpose of the event was to give stakeholders the opportunity to meet new Members of the Committee and to speak to them about their priorities and aspirations for the Committee. Individuals from organisations such as Careers Wales, Federation of Small Businesses, Arriva Trains Wales, Network Rail and Colegau Cymru arrived at the Senedd to view the Committee’s meeting first of all. This was an opportunity to see the Committee Members question the new Cabinet Secretary for Economy and Infrastructure, Ken Skates AM and to listen to his priorities and the content of his portfolio. Following the Committee Meeting, stakeholders and Committee Members met at the Urdd Centre, where an event under a ‘speed-networking’ format took place. Everyone were allocated to a table with people from different sectors and Assembly Members from the Committee. There were discussions during the event around different aspects of the Committees remit. They discussed that the Committee needed to look into various options for taking forward changes to business rates and also need to consider city regions, their purpose and what levers will they be given to succeed. Discussions around transport included looking into the Government’s preparations for the next Welsh Rail Franchise and considering what improvements have been made to integrated public transport. When discussing skills questions were raised around whether Wales is training the right people for the right skills. There was also a discussion around the Welsh Government’s budget reduction to Careers Wales and the impact of this on their role and remit. The Committee will now take into consideration the points raised during the event in order to inform and shape their work for the next five years. If you’d like further information about the Committee, or would like to keep up to date with their work, you can visit the Committee’s webpage. #SeneddWrexham blog: It’s been a busy week in Wrexham! During the last week of March the National Assembly for Wales held its week-long #SeneddWrexham series of events. Here Lowri Lloyd Williams, the North Wales Outreach Manager runs through the week’s events. 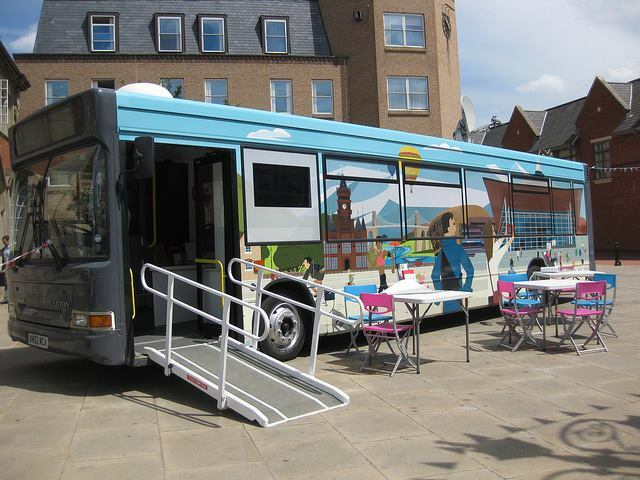 Launching #SeneddWrexham, we parked the Assembly bus in the town’s Queens Square, where we had a steady stream of visitors during the day. Mr Pugh was our first visitor, who stopped by on his way to collect milk for his wife, to raise points around transport in the Wrexham area. He was concerned about the road surfaces as well as the amount of roadworks on the A55 and its effect on the area. Parking charges was also a point Mr Pugh wanted to raise. Other issues raised on the bus during the day included broadband speed, raising awareness of the Assembly’s work and health related matters, specifically breast cancer services. Andrew Atkinson and Alex Jones from Wrexham Business Group also came on the bus to raise points about business rates. They left the following video regarding business rates in the town. We were also visited on the bus by Dr Helen Paterson, Chief Executive of Wrexham Borough Council and John Gallenders, Chief Executive of AVOW (Association of Voluntary Organisations Wrexham) who encouraged their staff to get involved in #SeneddWrexham. Day two of #SeneddWrexham and the Assembly bus was back in Queens Square, and the people of Wrexham were still making the most of our presence, and coming to see us with plenty of questions, comments and matters to raise. Health again was a popular topic with waiting times, cross border services and free prescriptions among the matters raised. Members of the public who raised these were encouraged to contact their Assembly Members to discuss further and look at the work the National Assembly for Wales Health and Social Care committee have done recently. We were delighted to be joined by Welsh Baccalaureate students from St Christopher’s School, Wrexham during the morning. They were given a short presentation on the National Assembly for Wales and as part of the Votes@16 consultation we had an interesting debate around lowering the voting age to 16. You can find out more about the consultation here. They also thought that young people should be given more opportunities to learn about politics and that Assembly Members should commit to having young people shadow them. St Christophers School during their visit to the bus. We were also visited by Lynn Morris and Yvonne McCarroll from Wrexham Tenants Group who wanted to learn about ways that tenants could get involved and have their say on issues that affect them. As I work for the Outreach team in North Wales this gave me a really good new contact in the Wrexham area that I can contact when working with the Assembly’s Committees on future consultations. On Tuesday night we visited young people at The Vic in Wrexham to do a session on what the Assembly is, how many Assembly Members they have and what their job is. 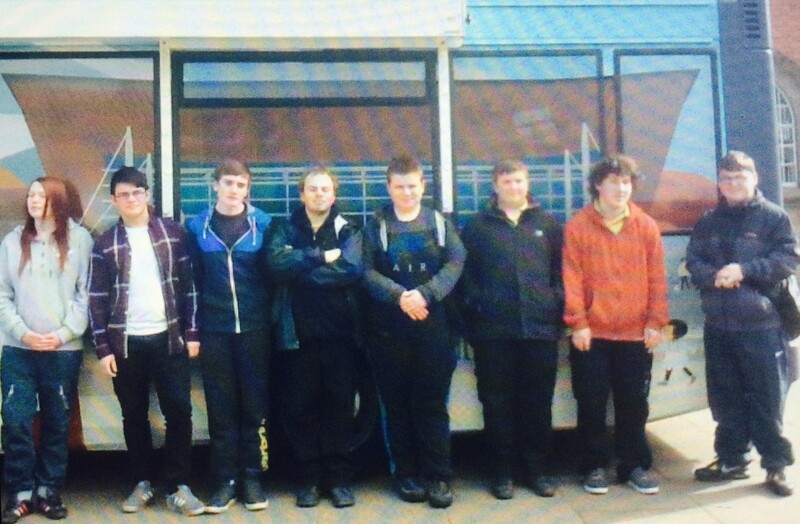 Other members of the team were with Dynamic Wrexham holding a similar interactive session. The Assembly’s presence in the center of town for #SeneddWrexham continued on Wednesday with the team setting up a pop-up stand at Contact Wrexham on Lord Street. People took the opportunity to speak to Assembly staff as they visited Wrexham council for other matters. We also had a presence at the Info Shop in Wrexham on Wednesday to get young people to complete the Vote@16? Consultation. We met with some really interesting young people who have strong opinions about the topic. We spent some time with Lacey, 22, from Wrexham, who is against lowering the voting age as there is not enough education for young people and so they don’t know who to vote for. 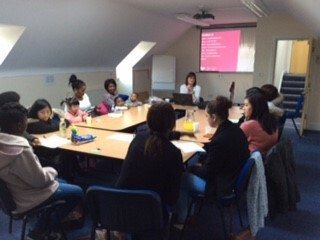 We also visited BAWSO during the morning to hold a session explaining the areas effecting their life that the Assembly is responsible for, who represents them and how they can raise issues with the Assembly. Participants during the BAWSO session. #SeneddWrexham continued to pick up pace on Thursday with activities and events all over the town. 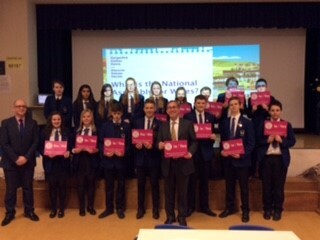 The Assembly was at Coleg Cambria all day where students streamed in to take part in the votes@16 consultation where we wanted to hear what 11-25 year olds think about lowering the voting age to 16. We had over 300 consultation questionnaires completed during the day. Our website, ‘Your Assembly- your say, your way, will be updated regularly to let you know how the conversation’s developing. The students staged a ‘Your Assembly takeover’, where their content took over our website aimed at young people for the day. You can view photographs from the day in our Flickr Album. Over in Glyndwr University during the afternoon, the Assembly’s Presiding Officer Dame Rosemary Butler AM met with young people from Wrexham to discuss the Assembly’s Vote@16? national conversation. The event was delivered in partnership with Wrexham Senedd yr Ifanc. We also managed to squeeze in another two understanding and engaging with staff from Wrexham Council and Caia Park Jigsaw group where we were joined by the Assembly’s Deputy Presiding Officer, David Melding AM. The day ended with a #SeneddWrexham reception hosted by the Presiding Officer Dame Rosemary Butler AM. It was a successful event with around 70 local people present where we celebrated the work of community champions in the Wrexham area. To the sound of musicians from Coleg Cambria there was plenty of networking between politicians, leaders of civic and community leaders during the evening. The final day of #SeneddWrexham arrived and it was another busy day for the team. Friday started with our education officers over in Rhosnesni High School where over 150 young people took part in the votes@16? consultation. This was followed by a session with the school council. Deputy Presiding Officer David Melding AM joined in with the school council meeting where they discussed the issues they had tackled within the school during the past 12 months, including school uniform. The school council having their say for votes@16. After spending the morning on our pop-up stand at Glyndwr University, I spent the afternoon with a group from Hafal in Wrexham delivering the final understanding and engaging workshop of the week. It was an interactive session with plenty of discussion and we were joined by Aled Roberts AM where he spoke about his role as an Assembly Member. The Hafal group following the presentation. Meanwhile, over in Glyndwr University members of National Assembly for Wales and Cardiff University staff met with students and hyperlocal bloggers and journalists. The event was part of the Presiding Officer’s Democratic Deficit initiative, to try and help community journalists around Wales to access information about the Assembly more easily. The Presiding Officer has pledged to work towards addressing the ‘Democratic Deficit’ caused by large numbers of people in Wales consuming news and current affairs from UK broadcasters and media organisations which often ignore the different public policy landscape in Wales compared to England. Journalists, including many from the Glyndwr journalism school, had the chance to interview the Presiding Officer, Dame Rosemary Butler AM and the Deputy Presiding Officer, David Melding AM. They also attended a press conference style event with Dame Rosemary Butler AM. 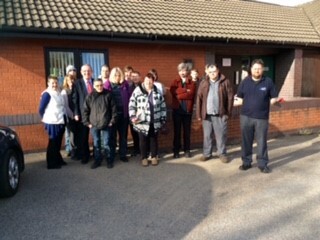 We would like to thank everyone who engaged with us during the week for the lovely warm welcome that we had in Wrexham. It’s was a fantastic week and I know we’ve all had a lot out of the work that we’ve done and hope that you have too. You can view photographs from the week in our Flickr album . If you’d like to learn more about the work of the Outreach team in North Wales, then you can contact the Assembly on 0300 200 6565 or contact@assembly.wales.